If you are looking for a way to wander through the vineyards, however walking the Terrasses de Lavaux Trail is a bit too long then the second best thing (or maybe the BEST thing if you have train loving children) is this small train on wheels that takes you up into the vineyards for an hour ride crossing through the terraced hillside of the Lavaux region. We opted for the "caboose" of the train which was great because we had an unobstructed view without any passengers or seats in front of us. We faced backwards and looked out over Lake Geneva and the landscape. The view was improved by rolling up the plastic windows, however if it is a chilly (or rainy) day I imagine keeping the plastic windows tied down would keep it warmer (and dryer). Lucas was in high heaven on this train. We have already gone back and done it again and he is still asking to go another time. There are two train options that alternate depending on the day of the week you take the train. We went on a Saturday morning and therefore took the train from Cully. 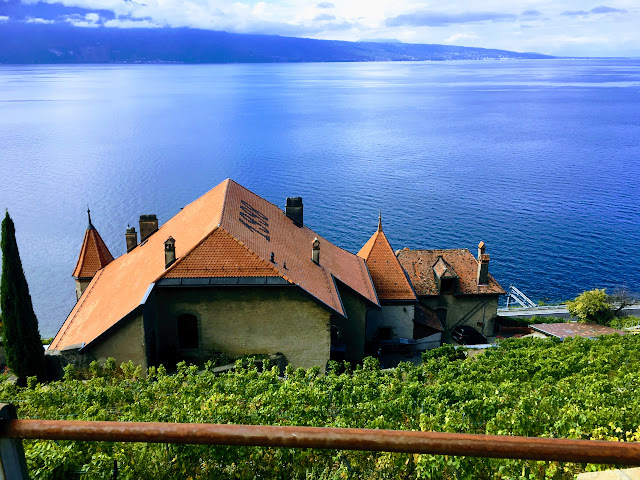 It zigzags up into the hillside passing through small wine making towns while following part of the "Terrasses de Lavaux" wine trail. The train makes 1 stop at a small wine buvette where it is possible to taste wine, buy bottles of local wine or glasses of grape juice (which Lucas also loved!). At the wine stop in Dézaley (sign post above at the stop) we got out, stretched our legs and enjoyed the views while sipping a glass of wine and grape juice. The town of Cully is very sweet with flower lined homes situated right on Lake Geneva. There are several options for dining - we chose a casual place that had tables set up in the grass along the lake next to the Lavaux Express. 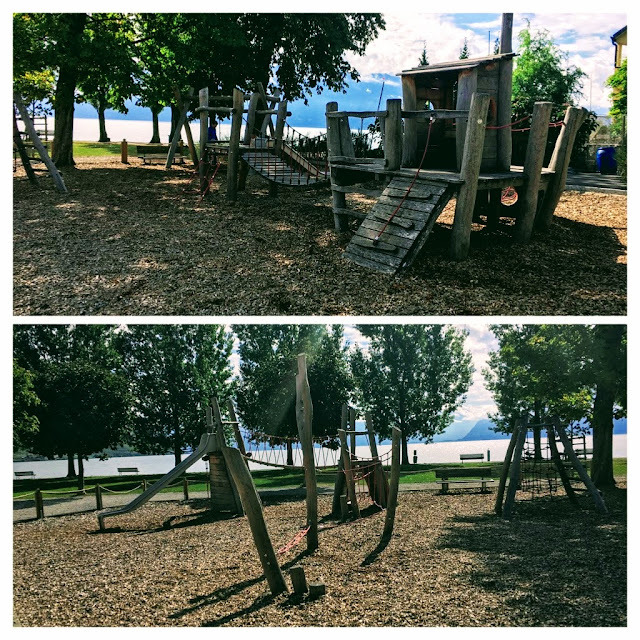 There is also a large wooden playground situated next to the Lavaux Express ticket booth which the children enjoyed both before and after the train ride. Because Lucas is under 3 he was free as a lap child so the 4 of us fit nicely on the back seat of the train together. Below shows the four of us taking a selfie and then below that 1 of the views we had from our back seat looking out on the vineyards. Small Wine Buvette set in the middle of the vineyards. My friend and I hiked this 6.8 mile (11 KM) trail with strollers. For information the hiking trail click here.